As if tornadoes and damaging thunderstorms were not enough, historic flooding is also threatening the Mississippi River, below St. Louis, as well as the lower part of the Ohio River. The rising waters are expected to top levels set during February 1937. This mark is the middle Mississippi Valley's equivalent to the 1993 event farther north along Old Man River. Even if rain were to fall at a normal rate for the remainder of the spring, the consequences of what has already happened in the Midwest will affect the way of life, property, agriculture and travel/shipping/navigation for weeks in the region. While the amount of evacuees currently numbers in the hundreds, it could soon number in the tens of thousands as levees are topped or breached and rivers expand their girth into more farming communities, towns and cities. The flooding problem is not only affecting the major rivers, but also smaller rivers and lakes in the region. In order to mitigate flooding on the Ohio, water releases were being cut back at Kentucky and Barkley dams on the Tennessee and Cumberland rivers and will result in record lake levels. 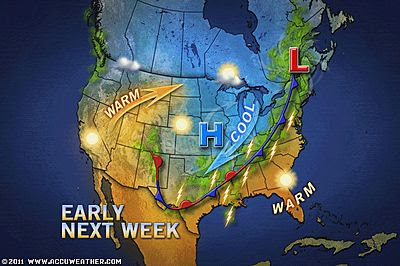 The current stretch of rain-free weather is forecast by AccuWeather.com meteorologists to come to an end over the weekend. The area experiencing the worst flooding could be hit with up to a half foot of rain over a several-day stretch late in the weekend into early next week. River levels along the Mississippi and Ohio rivers in southern Illinois, southeastern Missouri, western Kentucky and northwestern Tennessee are forecast by National Weather Service hydrologists to set new record highs this weekend. The level Friday at Cairo, Ill. was within 0.5 of a foot of equaling the record mark of 59.5 feet. Cairo, with a population of nearly 3,000 people, lies on the peninsula of where the Mississippi and Ohio rivers meet. A general 6 to 12 inches of rain fell on portions of southeastern Missouri, southern Illinois, western Kentucky, Arkansas, Indiana, Ohio and western Tennessee this month. However, there have been much higher amounts locally. Cape Girardeau, Mo., has received over 19 inches of rain so far this month, which is over five times that of normal for the entire month of April. A total of 14.50 inches of rain has fallen in five days in the city along the Mississippi River. 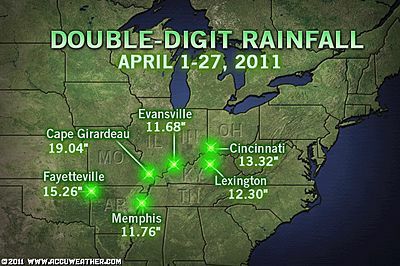 Cincinnati, Ohio has received over a foot of rain, which is around four times its normal rainfall for the entire month. The additional rain forecast could prolong flooding problems by slowing the recession of waters days later or leading to a second crest in some cases. Record- or near-record water levels are taxing levees in the region. Levee breaches have resulted in flooding in Poplar Bluff, Mo. and Pocahontas, Ark. along the Black River. The stress on the levees in some locations will not only last days, but weeks, as huge rivers such as the Mississippi and Ohio take much longer to fall below flood stage than smaller rivers, even as heavy rain comes to an end. However, the high water levels on these big rivers are affecting the drainage of other smaller rivers that feed in. Flooding Farmland to Save a Town? The Army Corps of Engineers got the go-ahead to breach the levee at Birds Point, Mo., in order to possibly prevent a levee breach at Cairo, Ill. It is believed this may take some of the pressure off the levee protecting the town. Birds Point is a farming community. The planned breach prompted a court battle between the Corps and the Missouri attorney general late this week. Although not forecast to reach record levels, there are other stretches of the Mississippi River farther north and south, and part of the Ohio River farther to the east, that have been and will continue to remain well above flood stage. 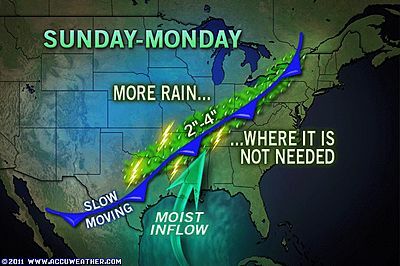 The high water and saturated ground will continue to delay the planting of some crops. Fortunately, the growing season in this region is long, and evaporation rates will continue to increase into the first part of the summer. The region and the souls that work the land are notorious for bouncing back after spring flooding, provided conditions turn favorable in the month or two ahead. As a pocket of chilly air develops in the Northeast during the first part of May, the battle zone may still lie over the Midwest, where the warm, moist air continues to charge in from the South and rise violently, forming the relentless downpours and big storms. While the rainfall forecast during May will probably not sustain the flood levels at present or soon to be experienced, it could continue to produce well-above-average stream flows and river levels above flood stage through much of the balance of spring. In addition, the weather pattern will favor, at the very least, episodes of flash and small stream flooding on a local basis in the region through much of May. 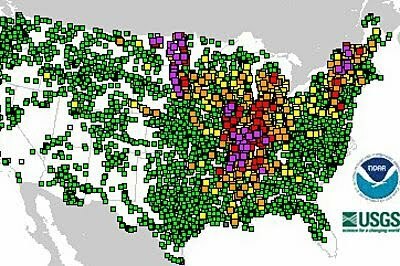 With the shift in the cool pocket and further confrontations with warmth and chill, there may be an increase in the risk of storms with severe weather and flooding farther north over the Midwest than what we have seen so far this spring. The surge of high water will also continue to work downstream in the weeks ahead, reaching areas from Memphis to New Orleans. The flooding Ohio River at Louisville, Ky. has impacted some Kentucky Derby Festival events, forcing them to move to higher ground. Ohio River flooding is not expected to impact Churchill Downs for this week's race activities and the Kentucky Derby, Saturday, May 7. What about the stress to the New Madrid fault? omg that voice talking scared the crap out of me. You should put a warning at the top of the page about this "voice chat" cause all I did was google "Kentucky and Barkley dams on the Tennessee and Cumberland rivers" to find out what places are flooded and your page came up so I had no idea what to expect....and my speakers were turned up LOUD! LOL thanks!!!!!!!!!!! !